Publisher's Note: Products purchased from Third Party sellers are not guaranteed by the publisher for quality, authenticity, or access to any online entitlements included with the product.The Most Complete, Up-to-Date Multimedia GuideThoroughly updated to cover the latest technologies, including mobile multimedia, this full-color resource prepares you for a successful multimedia career by teachingyou the fundamental concepts and required skills. 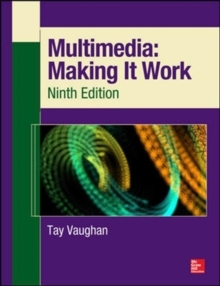 Multimedia: Making It Work, Ninth Edition explains how to integrate text, images, sound, animation, and video into compelling projects. 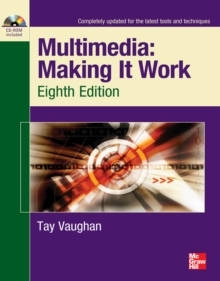 Multimedia project planning, costs, design, production, talent acquisition, testing, and delivery are also discussed. Chapter-ending quizzes reinforce key concepts and hands-on lab projects allow you to apply your new skills. 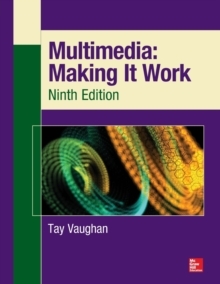 Learn how to:Master the essential elements of multimedia, including text, images, sound, animation, and videoIncorporate bitmap, vector, and 3-D imagesRecord and edit digital audio and use MIDICreate computer-generated animationsShoot and edit digital videoSelect the best hardware, software, and authoring tools for your projectDetermine the scope and cost of a multimedia projectn Design, produce, and test your projectAcquire the best content and talent for your budgetDesign dynamic Web contentCreate apps for mobile devices, including tablets, readers, and smartphonesDeliver multimedia over the Internet, in an app store, and on CD-ROM and DVDEach chapter includes:Learning objectivesFull-color illustrations and screenshotsHelpful notes, tips, and warningsChapter summaries and key term listsEnd-of-chapter quizzes and lab projectsThis book is intended for students enrolled in an instructor-led course and does not provide correct answers for the end-of-chapter quizzes or access to the instructor's resource materials. If you are an instructor, please contact your McGraw-Hill sales representative for details.